Trees , to 12 m; trunks short, often crooked, longitudinally or transversely fluted, crowns spreading. Bark gray, smooth to somewhat roughened. Wood whitish, extremely hard, heavy. Winter buds containing inflorescences squarish in cross section, somewhat divergent, 3--4 mm. Leaf blade ovate to elliptic, 3--12 × 3--6 cm, margins doubly serrate, teeth typically obtuse and evenly arranged, primary teeth often not much longer than secondary; surfaces abaxially slightly to moderately pubescent, especially on major veins, with or without conspicuous dark glands. Inflorescences: staminate inflorescences 2--6 cm; pistillate inflorescences 1--2.5 cm. Infructescences 2.5--12 cm; bracts relatively uncrowded, 2--3.5 × 1.4--2.8 cm, lobes narrow, elongate, apex nearly acute, obtuse, or rounded, central lobe (1--)2--3 cm. Carpinus caroliniana consists of two rather well-marked geographical races, treated here as subspecies. These hybridize or intergrade in a band extending from Long Island along the Atlantic coast through coastal Virginia and North Carolina, and then westward in northern South Carolina, Georgia, Alabama, Mississippi, and Louisiana. Plants with intermediate features are also found throughout the highlands of Missouri and Arkansas. J. J. Furlow (1987b) has described the variation of this complex in detail. Native Americans used Carpinus caroliniana medicinally to treat flux, navel yellowness, cloudy urine, Italian itch, consumption, diarrhea, and constipation, as an astringent, a tonic, and a wash, and to facilitate childbirth (D. E. Moerman 1986; no subspecies specified). Tree or shrub 5 - 12 m tall, trunk 15 - 30 cm in diameter Leaves: alternate, short-stalked, bluish green above, paler and hairy beneath, 5 - 12 cm long, 3 - 6 cm wide, elliptic to oblong or egg-shaped with a pointed tip, toothed with largest teeth at ends of straight and unbranched veins. Leaves turn red or orange in fall. Flowers: either male or female, found on the same tree (monoecious), borne in green catkins. Male catkins are 2 - 6 cm long with boat-shaped scales and develop in fall but remain enclosed in a bud until spring. Female catkins 1 - 2.5 cm long with hairy scales. Fruit: a tiny nut attached at the base of a bract, borne in loose terminal clusters 2.5 - 12 cm long and persisting late into fall or winter The leaflike bract is 2 - 3.5 cm long and three-lobed with the middle lobe longest. Nut brown, egg-shaped, and ribbed. Bark: deep bluish gray, thin, smooth with muscle-like ridges. Twigs: slender, pale green and hairy, changing to shiny dark red, and then gray. Terminal buds: absent. Leaf scars: crescent-shaped with three bundle scars. Form: spreading with a short, crooked trunk. End and lateral buds: somewhat angled around the stem, 3 - 4 mm long, narrow egg-shaped, scales brown with a white margin. Similar species: Carpinus caroliniana and Ostrya virginiana are similar when young because they both have smooth bark, however, the bark of Ostrya virginiana becomes shredded with age. Ostrya virginiana also has leaves with veins that fork near the margin and clusters of nuts enclosed by inflated bracts. Carpinus caroliniana ssp. 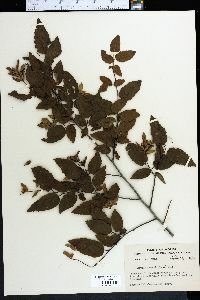 virginiana differs from the typical variety by having dark glands under the leaves. The species in our area belong to ssp. virginiana. Habitat and ecology: Understory of mesic woods, often in poorly drained soils. Notes: The wood was once used for making ox-yolks. It is still used to make tool handles and wedges. Etymology: Carpinus is the Latin name for hornbeam. Caroliniana means "from the Carolinas." The common name blue beech comes from the smooth beech-like bark that is blue-gray. The common name hornbeam comes from using the wood to make ox-yolks. Tall shrub or small tree to 10 m, with flattened trunk and smooth, muscular-looking, blue-gray or ashy-gray bark; lvs oblong to oblong-ovate, 5-12 cm, acute or shortly acuminate, sharply and often doubly serrate; fruiting catkins ovoid to short-cylindric, 2-5 cm, the bracts (1.5-)2-3(-4) cm, halberd-shaped, with 1 or 2 divergent basal lobes, entire or with a few coarse teeth especially along one side of the middle lobe. Moist woods; N.S. to Minn., s. to Fla. and Tex. Most of our plants belong to the var. virginiana (Marshall) Fernald, with the lvs beset with conspicuous dark glands beneath. Along the s. margin of our range this passes into var. caroliniana of se. U.S., lacking the dark glands of the often smaller and less toothed lvs, and with blunter, less toothed bracts.